This blog is written and edited my me and I thought most people would use their common sense when it came to my posts companies and make-up reviews etc, but I have had a few comments which made me realize that I need to be clearer so people don't get the wrong idea...My reviews are honest, based on personal experience and If I am given a product to try it won't affect my opinion despite being sent by the company/manufacturer.Some of the products I review are things I have bought, other companies send me the things they would like me to review.I DO NOT get anything in return for the things I write and review in this blog (apart from du'as inshaAllah). The companies send me products to give my honest opinion on them and that is exactly what I do.I shall not be responsible if any product(s) reviewed does not suit you in any way. Anything you do copy MUST have a link back to www.sanasramblings.com . 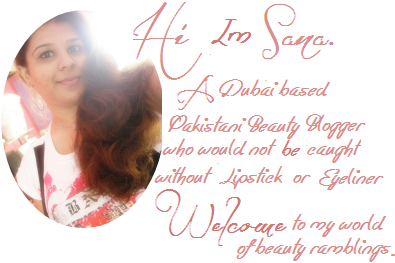 All of the images on Sana's Ramblings are also my own until stated otherwise. And again I would appreciate if people did not copy these images and place them elsewhere on the internet unless a link back is included. I am affiliated with Sigma Beauty and I might share my affiliate links in some of the posts for which I have got commission when someone click on the link or purchase through the link . You can support Sana's Fashion Ramblings by purchasing through those links & do not receive any kind of compensation for my reviews which are solely written on my own experience . Other images that are not mine will not have a watermark on it and most, if not all of these images have been taken from 'google images' so they are available to the public. I hope I have made that clear and understandable, if you have any further questions e-mail me at sana.s.ansari@hotmail.co.uk .